On a visit to Piedmont in 2004, Matteo Molino stood out amongst our group of Langaroli – and not just for his exceptional height! His wines were great and well-priced. He was quick to understand both the potential and challenges of our market. And he spoke English very well, with a great passion for Nebbiolo – not just his own. In the next decade, he and his younger sister Martina would take over the reigns at their father’s estate, and guide it into the international spotlight by both making great wines and traveling to engage and charm international customers into Molino fans. Mauro Molino, Matteo and Martina’s father, founded the estate. In 1973 Mauro graduated from enology school in Alba, and then followed that with five years of winemaking experience in Emilia Romagna. In 1979 after his father’s passing, he returned home to the family farm in La Morra and began consulting for local wineries while building up his own estate. 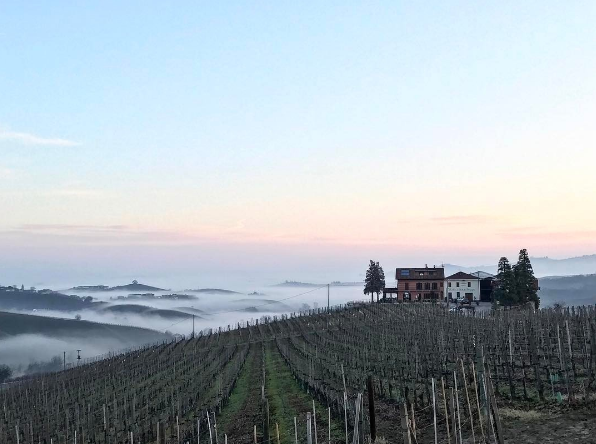 1982 was the first vintage from the famed family parcel in Conca dell’Annunziata, the conch-shaped parcel pictured above, and the rest is history. In 2003 Matteo joined the company and became a familiar face to our staff, and then in 2009, Matteo’s sister also joined the gang. Today they manage approximately 12 hectares of vineyards, 50% dedicated to Nebbiolo for Barolo, and the rest mostly Barbera, and Dolcetto. This estate practices sustainable viticulture.